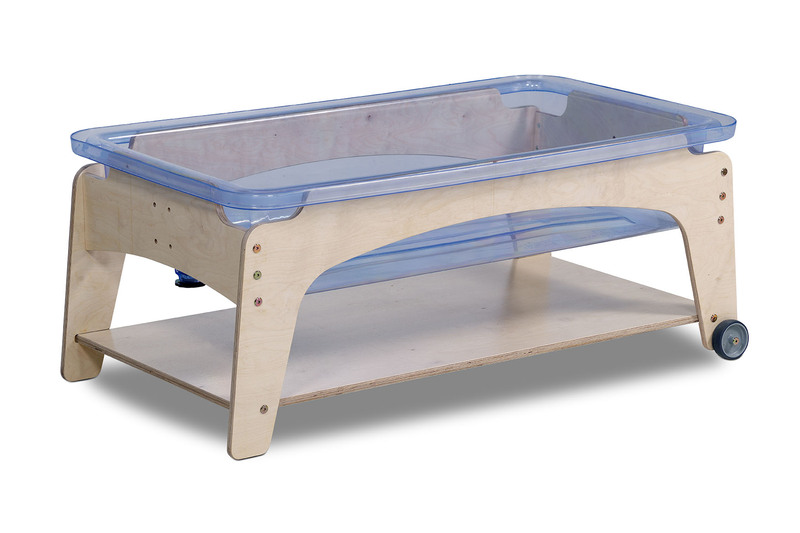 Sand and water play station, ideal for use in pre-schools, nurseries and reception classrooms. Sand and water play encourages sensory development and provides the ideal opportunity for children to explore the benefits of messy play. It helps to improve their co-ordination skills by developing arm and hand muscles. 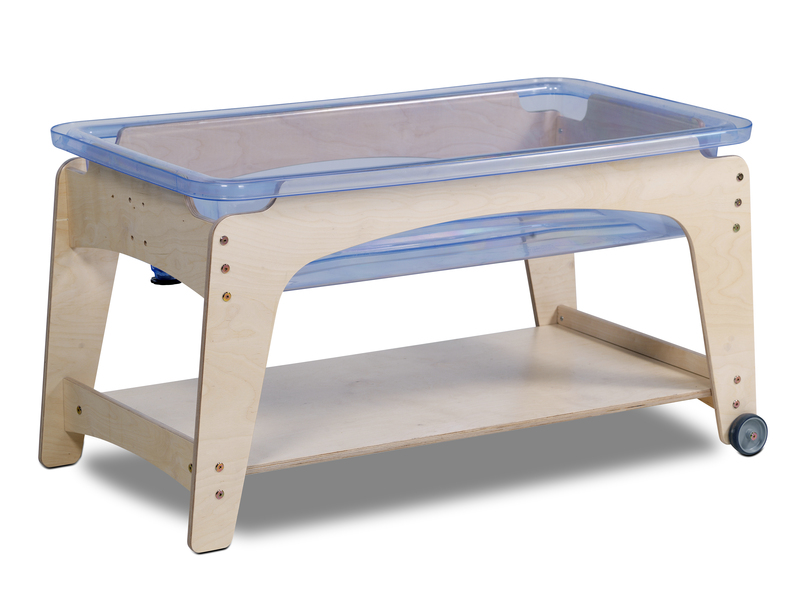 This sand and water play table is made from high-quality birch-plywood and finished with a protective waterproof coating which allows the unit to be used indoors and outdoors. The clear plastic tub is manufactured from polycarbonate. This tub holds the water or sand and is extremely hard-wearing. The screw-on plug in the tub makes emptying water contents and cleaning the play station easy. Choose from a choice of 3 different heights to suit children of all ages – 29cm suitable for 12 months+, 44cm for 2 years+ or 59cm for 4 years+. Complete with wheels at the end of each unit make for easy mobility. This unit has been designed with early years in mind and has with rounded corners for increased safety. Supplied with a wooden lid which makes for easy and mess-free storage. Alternatively, the wooden lid can be used as a work surface when in place. The two taller units come with a shelf below the plastic sand and water tray which can be used for additional storage. Using a sand and water table enables children to see how water behaves when it is being poured and splashed. Provide children with different objects so they are able to see which float and which sink and develop their understanding of weight and density of everyday items. Sand play helps to promote social skills among early years. When children work together at the sand table they are faced with real problems that require sharing, negotiating and compromising. Implement mathematical and scientific problems into sand play by providing children with measuring scoops, magnets and buried treasure and containers in a variety of shapes and sizes. 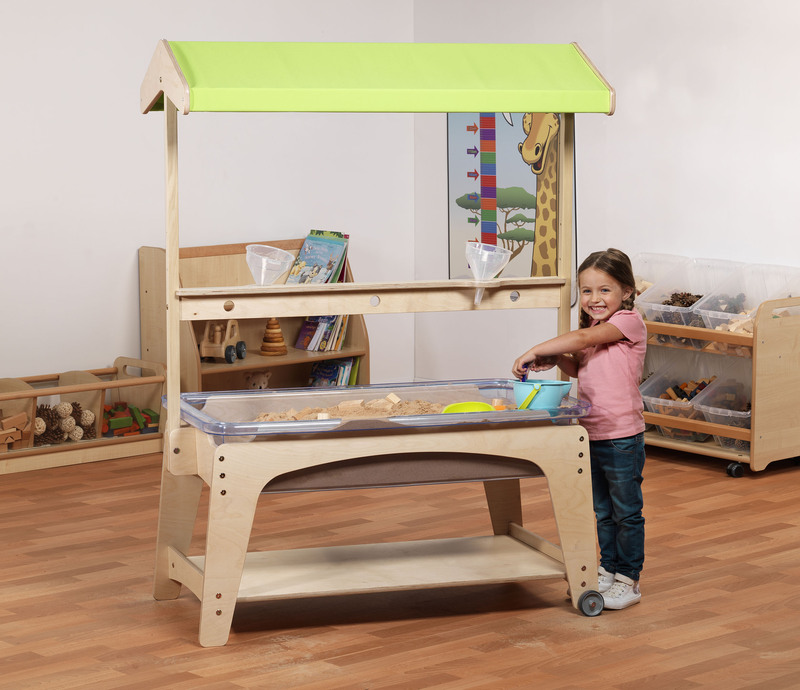 The canopy and accessory kit is a great addition to the sand and water play station. The kit features funnels and plastic tubing plus an adjustable activity shelf, great for holding these items. The canopy comes in a green fabric and is made from exterior grade, washable wipe-clean fabric. 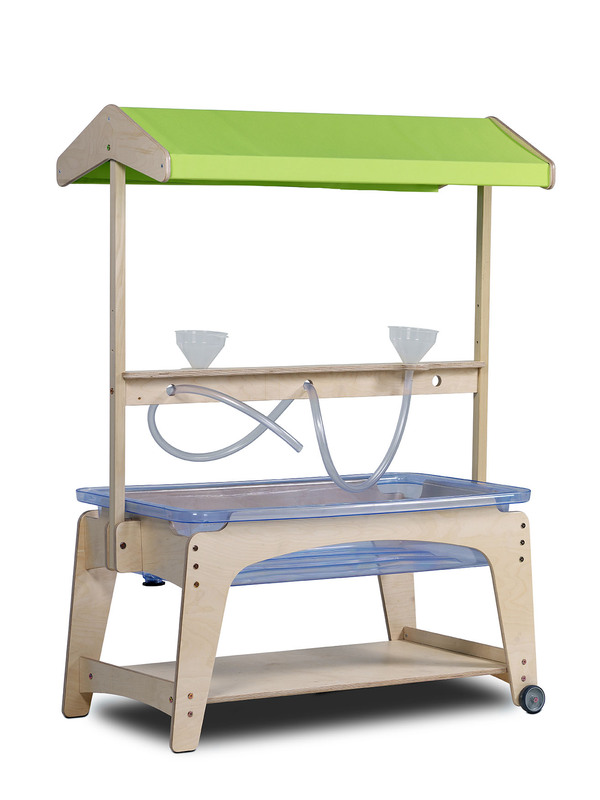 Easily attach the canopy and accessory kit to the sand and water play tray with the allen key and bolts provided. The canopy and accessory kit is simple to use and the canopy provides a level of sun protection to early years when using outdoors. All 3 sized units, as well as the canopy and accessory kit fully conform to BSEN71. This deems them safe to use by children. If you require any further information on the Sand and Water Station, please contact us or call our sales team on 01733 511 121.